In today’s world, a free flow of information is crucial. Anybody, anywhere could have that vital idea or insight that could mean the difference between success and disaster. Humble Inquiry was inspired by Schein’s twenty years of safety work in high-hazard industries including the health-care system, where honest communication can literally mean the difference between life and death. Schein defines Humble Inquiry as, “The fine art of drawing someone out, of asking questions to which you do not know the answer, of building a relationship based on curiosity and interest in the other person.” In other words, do ask, don’t tell. Humble Inquiry builds the kinds of positive, trusting, balanced relationships that encourage honest and open interactions in both our professional and personal lives. 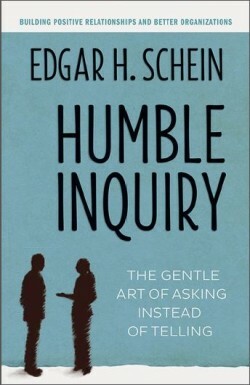 In this seminal work, Schein explores the various types of humility, contrasting Humble Inquiry with other kinds of inquiry. He illustrates the benefits Humble Inquiry offers in many settings, and offers advice on overcoming the cultural, organizational, and psychological barriers that keep us from practicing it. This is a major new contribution to human dynamics and relationships, presented in a compact, personal, and eminently practical way. Edgar H. Schein is the Society of Sloan Fellows Professor of Management Emeritus and a Professor Emeritus at the MIT Sloan School of Management. He is the author of many articles and books, including Helping; Process Consultation Revisited; The Corporate Culture Survival Guide; Organizational Culture and Leadership; and Career Anchors. He has defined the field of organizational culture and has consulted with many organizations in the United States and overseas.